What if it were possible to meet the man of your dreams -- in just ninety days? Renowned psychologist Dr. Diana Kirschner has helped thousands of women do just that over the last twenty-five years. 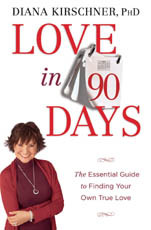 In Love in 90 Days, she reveals her fail-proof guide for any woman to create a fulfilling relationship that lasts. Why am I attracted to the wrong kind of guys? Why is he just not that into me? Why can't I seem to find the One? • Develop your own powerful and personalized Dating Plan that includes meeting lots of successful and caring men. Plus, special sections reveal the secrets of dating success for single mothers, African-American women, successful women, and those who are over forty-five. Forget your dating past, gather your girlfriends together, and learn how to create the love you want now.